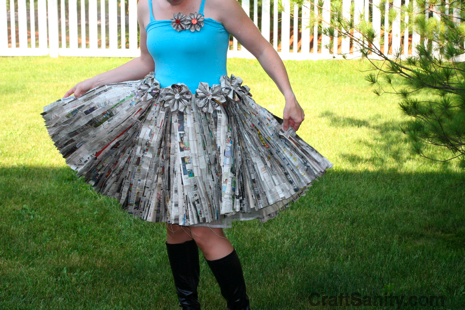 This is the “Headliner” newspaper dress that I made for last night’s “Recycled Runway” event at the UICA here in Grand Rapids, Michigan. I’m pleased to report that I walked the runway and survived. Boy, I’m glad that’s over. I like the design and sewing part of fashion, but don’t really dig the runway bit. To make the dress, I cut a circle skirt out of muslin and sewed it to the lower half of a recycled T-shirt. 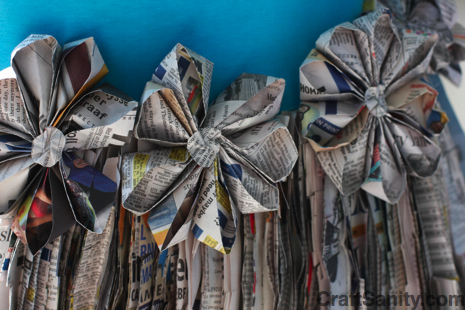 Then I cut strips of newsprint, creased them in the middle and sewed them vertically along the crease to cover the skirt. This part was much more time-consuming than I expected, especially when I realized I had to hand-stitch the last bit when I could no longer cram it into my sewing machine. The newspaper strips made the skirt really stiff, so I clipped the strips every few inches to decrease the stiffness a bit. I made a netted half-slip out of the under skirt of a bridesmaid dress that I found at a local thrift store. This gave the dress a little more fullness. I took the detail photos today, so the flowers aren’t as perky as they looked yesterday. That’s the down-side of newsprint. Fashion is fleeting. 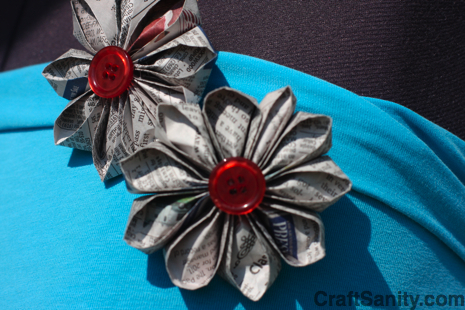 Design inspiration: I recently left my job at the Grand Rapids Press after more that 11 years to dedicate more time to my CraftSanity podcast and blog, make art, write books and start a freelance career writing for both print and online media. This piece is my tribute to the print industry that gave me my start as a writer. 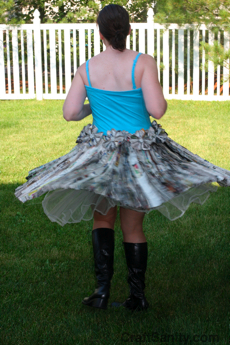 I used strips cut from more than a dozen issues of the Press to make this dress. It’s essentially a dress made of stories. Newspapers have been part of my daily routine as a writer and reader. They have provided a tangible record of both personal and public history, documenting everything from births, deaths and weddings to major local and world events. I love that you can fold up a newspaper and put it in your bag to read later, then use it as wrapping paper in a pinch. The future of print media is uncertain, but I know this for sure: Making a dress out of the Internet just wouldn’t be the same. I didn’t “work” the stage, but instead ended up interacting with the crowd. I started out exchanging high-fives with my daughters at the end of the runway, then all the other little kids gathered by the stage. So my walk was more like the congratulatory exchange between teams after sporting events than a fashion show strut. The show was pretty relaxed in nature so nobody seemed to care. The important thing is that my dress stayed up. The jersey bodice got a little stretched out from being taken on and off the dress form, so I pinned and stitched it to my bra to make sure it didn’t budge. As I mentioned in my previous post, I covered my bra straps with fabric from the T-shirt I cut up so I could skip the risk of going strapless. I figured I was tempting fate enough by simply going on stage. I carried my Flip video camera around behind the scenes and my husband, Jeff, shot the runway show, so check back here a bit later to see the video we shot of the show that included fun designs by my friends, Bev and Cydney. Hello.This article was really interesting, particularly because I was browsing for thoughts on this subject last couple of days. Thank you a bunch for sharing this with all of us you really recognize what you are speaking approximately! Bookmarked. Please also consult with my web site =). We will have a hyperlink exchange arrangement between us!